The exclusive 50th Parallel estate winery in Lake Country, B.C. hosts some of the most private and beautiful weddings in the Okanagan. They have become such a popular place that the ownership has decided to build a dedicated wedding reception banquet space. This new building will be able to host the most lavish and luxurious destination wedding British Columbia has to offer. Paired with the fantastic ceremony site this is one of the top venues for weddings near Kelowna. One of the many tasks of a wedding photographer is shooting portraits of the groom before he walks down the aisle is the chance to get some stylish, candid shots. There is something very classy about a man in a plain button down shirt. When capturing shots of men indoors, I often use Rembrandt style to make the photo more interesting. Rembrandt is a style that stems from a Dutch painter who used side lighting to highlight the features of his subject’s face. In photography, this technique is achieved by posing a person next to a light source, such as a window. The image is shot in a way that creates depth and shadow on the person’s face. This is a very popular style of photography for wedding portraits, especially when it comes to the groom because it gives a masculine and compelling feel to the picture. This Rembrandt-style photo of the groom’s “getting ready” process was taken next to a window at the 50th Parallel Estate in Okanagan, British Columbia. 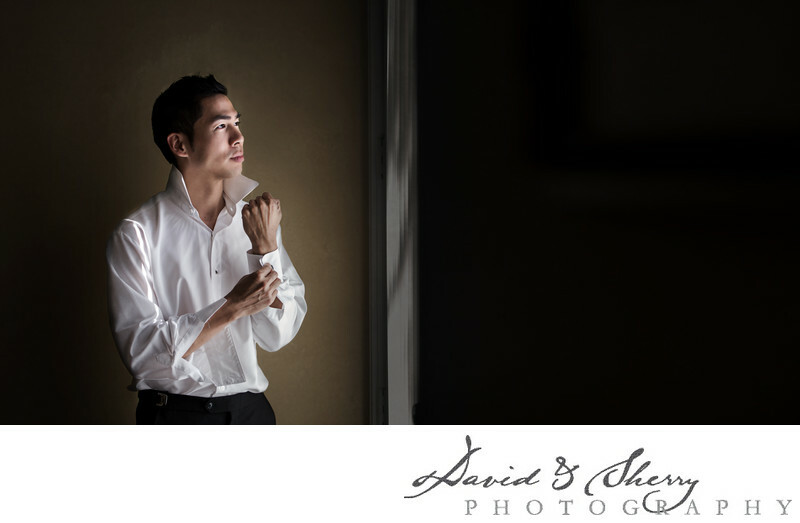 When giving instruction for this shoot, I simply told the groom to stand by the window and button his cuff links as he normally would, in order to keep the mood natural and candid. This is a very easy shot to get, but I love the mood and overall “sharp” feel that came out of it. Location: 17101 Terrace View Rd, Lake Country, BC V4V 1B2.